The 2015 Season for Whitechurch Tennis club began on April 1st and new members are very welcome. With no join up fee their annual subscription rates for adults, juniors, families and students are very competitive. While the Club continues to excel in competitions, its primary focus is to promote the enjoyment of the great game of tennis. Whether you are new to tennis or a seasoned pro, all levels of tennis ability are catered for. The club has had great success this season both at Senior and Junior level. Most recently their Grade 4 women’s team and Grade 5 men’s team have qualified for the finals of the Winter League. This is the flagship senior team competition in Munster with a record 36 clubs competing this year, with finals taking place in Waterford on April 12th. Their juniors recently won the U14 Wilson Shield and were runners up in the U12 Wilson Shield, great achievements for the club. Coaching programmes for all levels and ages are available with their resident professional coaches. Junior coaching takes place in the afternoons while adults of all grades can avail of club coaching in the evenings. This is a great way to sharpen your tennis skills and meet members at the same time. 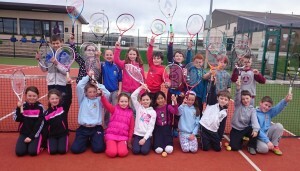 Whitechurch tennis club is a great place to play tennis in Cork offering modern tennis facilities to families and individuals of all ages and fitness levels. The club provides a welcoming and enjoyable environment for all to enjoy. The club enjoys a vibrant and active tennis committee who plan a busy and varied schedule of club nights, internal competitions and social events throughout the year for adult and junior members. If you would like to join the club, drop in to see them in The Community Centre Grounds Whitechurch or call Jenny on 087 1360474 You will be very welcome!